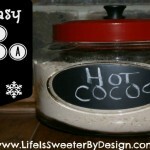 A creamy mix of hot cocoa that will warm anyone on a cold day! Use about 1/4 cup mixture to 6 ounces of hot water or milk. You can add more mixture for your taste preferences. This recipe makes about 10 cups worth of hot cocoa mix. Store in an airtight container. If you don't have a container big enough you can cut the recipe in half.